Tim Stancill rode a Model 3 like this back in the day. He raced the local scrambles tracks and did well. 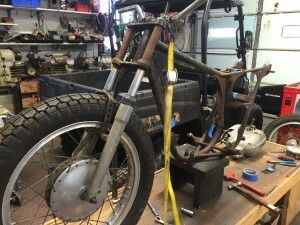 About four years ago, with the help of a friend, he located some of the original pieces of this Bultaco. I got a hold of the frame – it was a mess! As I ground off miscellaneous brackets and poor repairs, I noticed the unit was bent – not worth repairing. 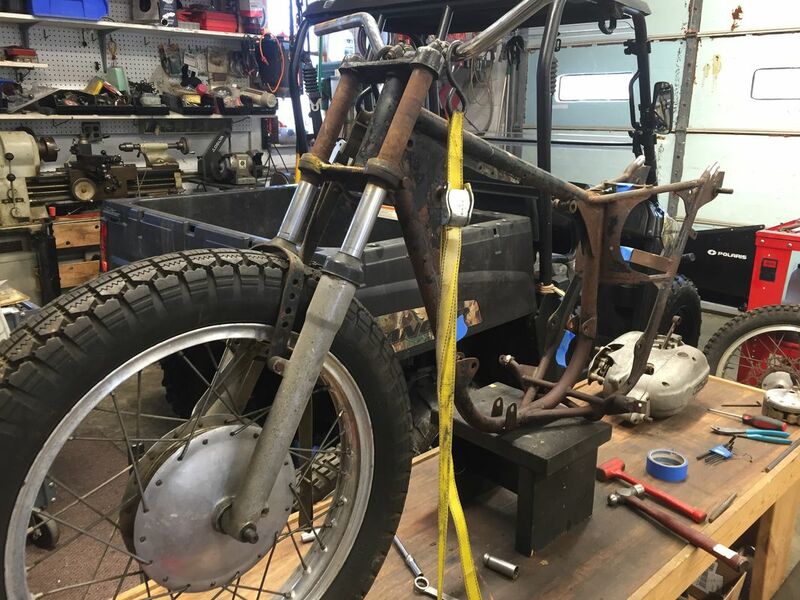 We went to Hughes Bultaco in New York and found the carcass of this Sherpa S – something we could work with. This frame also needed repairs, such as a new tail section, exhaust mounts, foot peg mounts, etc. It was quite a project. Heidi found the fenders in Germany, Jack and I made the handlebars, foot pegs and exhaust shield. Brian at J&B Moto did the paint work on the fuel tank. John Melniczuk helped out on the powder coating. Engine was rebuilt by Rusty Foard after many parts were purchased from Hughes! But it’s a very unique bike – you don’t see many of them around. We’re glad to have it on display.